This page is an information page for overseas readers. And useful information is offered towards those who wish the purchase of the peripheral equipment for iPod developed in Japan. However,Although many information on this page is described in Japanese, there is no schedule translated into a foreign language. My hope uses Web translation service etc., or has this opportunity learn Japanese, and desires an understanding in Japanese. Of course, you may have mail of an opinion, demand, and an inquiry written in English. I am waiting eagerly for many reactions. Mail magazine "iPod information magazine -iPodStyle -" Registration is here. Japanese iPod peripheral equipment and the accessories for Macintosh	can	be purchased at the following on-line shop. Please send an opinion, comment, other information, etc. with mail or B.B.S. 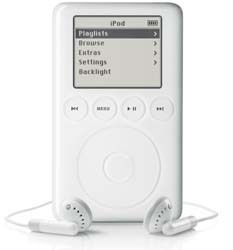 Copyright 2002-2005 - iPod Style - All rights reserved.